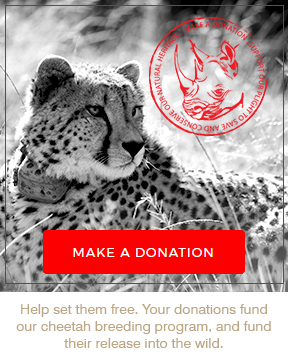 Zera is the beginning of the Gondwana Conservation Foundation’s (GCF) cheetah rewilding program. It is estimated that only 35 wild cheetah exist in the Western Cape. Zera is an adult female Cheetah we acquired in June 2016 and her story epitomises the challenges her species faces and the motivation we have every day to contribute to its survival. She has been in captivity for nearly all of her 7 years (in a space less than half a tennis court) and the GCF team has been transitioning her from a captive environment with the ultimate goal of releasing her into the wild. The aim is to establish a population of cheetah who can co-exist with lions, be fence respecting, and who are tourist habituated. Zera, and another younger female cheetah will form the initial population together with two male cheetah residing on Gondwana Game Reserve. They will shortly be released into a transitional 500-hectare section of the reserve (fenced off from the lions) to establish their wild hunting progeny. These cubs will then be introduced onto Gondwana Game Reserve. Zera is a suitable candidate for rewilding as she most likely was removed from the wild as a cub, displays strong hunting instincts and innate distrust of people, and she is able to breed and contribute to the meta-population. Zera has recently been moved to a well vegetated 3 hectare boma in the protected endangered species area of the reserve. The move was successful and stress free due to the many hours the team has spent preparing her with travelling crate. She entered the crate with ease on the day of the move – although her feistiness came out on the trip as she managed to enlarge one of the breathing holes quite considerably! Madam was a bit miffed! However, it took her about one minute to decide that her new, temporary boma, was very acceptable. She has since had many walking visitors and accepts them in her usual haughty, calm manner before she strides off like a super model on a catwalk with long strides and an indifferent stare into the distance. She is the beginning of this lovely story and program and we will keep you updated on the life of Zera and her next move to the 500-hectare enclosure where she will learn to hunt for herself and ultimately teach her offspring.